EventON should display all the events you add in the backend. If it is not check the following possible causes for not seeing all the events in the frontend. and make sure you are using correct shortcode. If you are using shortcode variables like event_type=’34’ etc. these filter events and show only the events that apply into those categories. Hence make sure you are using correct shortcode variables for what you want to show. 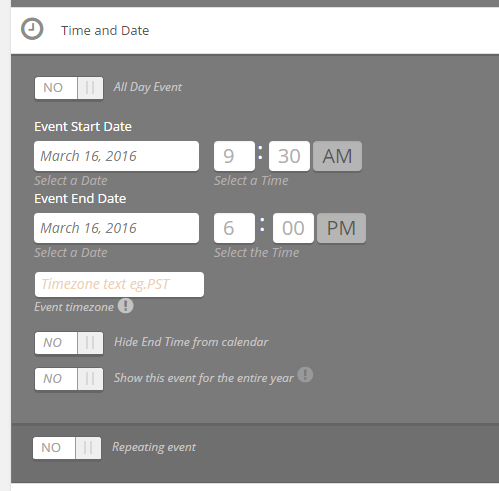 Compare the front end calendar and backend events you have added. Identify the event that is not showing in front end. Go to edit this event page & under Time and Date make sure you have entered correct date and time for the event so that it would appear correct in calendar. It is very important the date is saved correctly and after save shows exactly the date you want it to show. Go to myeventon settings. Make sure the Hide past is not enabled. If enabled this can hide all the past events, which can show less events on calendar than events added.